This National Trust property was built for entertaining, having played host to virtually every British monarch since George I. Enjoy five-star luxury at Cliveden’s Christmas House Party starting on Christmas Eve with a welcome of mulled wine and traditional carols sung in front of the fire in the Great Hall. 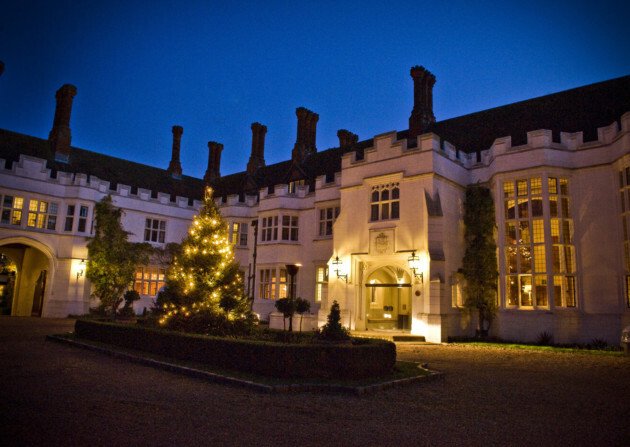 As Christmas Day dawns, enjoy a four-course Christmas lunch and a relaxing day of festive fun. Boxing Day includes a leisurely breakfast, a treasure hunt in the fabulous National Trust gardens, a guided tour, afternoon tea and a celebration dinner. Set in 300 acres of glorious woodland, parkland and picturesque formal gardens with a historic mansion at its heart, The Grove provides the perfect retreat for a luxurious festive break, with plenty to entertain the children, from making Christmas stockings to giant games and a Christmas cinema. The hotel provides an ideal picture-postcard setting in which to gather the family together for a nostalgic celebration. Guests will also be treated to Christmas dining to tempt every palate. Enjoy fine food and sparkling champagne amid the sumptuous setting of this grand hotel this Christmas. With 65 acres of gorgeous formal gardens overlooking the River Thames, the views from the rooms are simply stunning – some executive rooms even come with a balcony so you can fully appreciate the vista. From elegant furnishings to marble bathrooms and an award-winning spa, a touch of luxury is guaranteed, while attentive staff are sure to make your stay one to remember. This beautifully restored William III country house hotel set in 20 acres of manicured gardens close to York’s historic centre is particularly magical at Christmas time with its roaring log fires and candlelit rooms set amongst a backdrop of antiques and fine paintings. Arriving on Christmas Eve, a three-night stay includes a buffet afternoon tea on Christmas Eve, four-course Christmas dinner, and the option to see a pantomime at the York Theatre Royal on Boxing Day. Arrive at this imposing Elizabethan-style hotel on Christmas Eve to be greeted with a welcome gift before enjoying a warming drink and a live pianist performance. Christmas Day comes with all the trimmings and a visit from Father Christmas himself! On Boxing Day guests are invited to make a trip to the Theatre Royal to enjoy the local pantomime before returning to the hotel for mulled wine, mince pies and Christmas cake. Arrive to an array of festive treats followed by a champagne afternoon tea for two at the Savoy this Christmas. Enjoy a stay in a Superior Room of this historic hotel, where the Edwardian and Art Deco décor has been enjoyed by many famous faces over the years, including Winston Churchill, Frank Sinatra, Claude Monet and Katharine Hepburn. A stay at The Savoy this Christmas also comes with two tickets to Skate at Somerset House where you can glide across the ice rink under twinkling Christmas lights. Once owned by Queen Victoria, this idyllically located manor house will be suitably dressed for Christmas with holly and ivy adorning the stairs and fireplaces and a grand Christmas tree taking centre stage. Enjoy Christmas Eve mulled wine and mince pies on arrival and a traditional turkey dinner along with a slice or two of Christmas cake on the big day itself. On Boxing Day, walk off any gastronomic excesses at the nearby beaches, hills or mountains before leaving the hotel on the 27th after a Buck’s Fizz breakfast! Welcoming guests for over 130 years, this palatial highland hotel will be offering plenty of whisky and carols this Christmas Eve, while Christmas Day comes with a traditional meal and a visit from Santa himself! On Boxing Day guests are invited to enjoy a traditional jazz evening after taking time to explore the walkways around the 48 acres of gardens and grounds. For an extra special stay, book yourself in to one of the turret suites for panoramic views of the surrounding scenery.